SAN JOSE, Calif., December 7, 2017— Super Micro Computer, Inc. (NASDAQ: SMCI), a global leader in enterprise computing, storage, networking solutions, green computing technology and an SAP global technology partner, today announced that its latest 2U 4-Socket SuperServer (2049U-TR4) supporting the highest performance Intel® Xeon® Scalable processors, maximum memory and all-flash SSD storage has been certified for operating the SAP HANA® platform*. SuperServer 2049U-TR4 for SAP HANA supports customers by offering a unique scale-up single node system based on a well-defined hardware specification designed to meet the most demanding performance requirements of SAP HANA in-memory technology. Supermicro is collaborating with SAP to bring its rich portfolio of open cloud-scale computing solutions to enterprise customers looking to transition from traditional high-cost proprietary systems to open, cost-optimized, software-defined architectures. To support this collaboration, Supermicro has recently joined the SAP global technology partner program. Supermicro plans to continue expanding its portfolio of SAP HANA certified systems including an 8-socket scale-up solution based on the SuperServer 7089P-TR4 and a 4-socket solution based on its SuperBlade® in the first half of 2018. 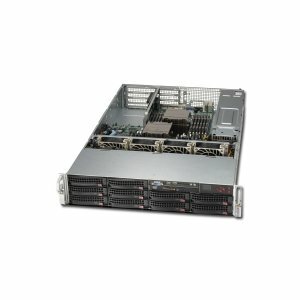 ASBISC Enterprises PLC as a value-added distributor proposes servers, storage systems and networking solutions by Supermicro across Central and Eastern Europe, Middle East and CIS countries. The company provide a variety of services including consulting, design, marketing, technical support, and financing. A long-term and trusted relationship with most of vendors helps to deliver best in class support to partners to create complex solutions and additional services. ASBISc Enterprises PLC (WSE: ASB) is based in 24 countries with a headquarter in Cyprus and specializes in the distribution of Information and Communications Technology products and solutions from global suppliers including Apple, AMD, Acer, Dell, Intel, Lenovo, Microsoft, Samsung, Seagate, Toshiba, WD. The company has its subsidiaries all over the EMEA region, more than 1,300 employees and 30,000 active customers in over 60 countries around the globe. Supermicro (NASDAQ: SMCI), the leading innovator in high-performance, high-efficiency server technology is a premier provider of advanced server Building Block Solutions® for Data Center, Cloud Computing, Enterprise IT, Hadoop/Big Data, HPC and Embedded Systems worldwide. Supermicro is committed to protecting the environment through its “We Keep IT Green®” initiative and provides customers with the most energy-efficient, environmentally-friendly solutions available on the market.